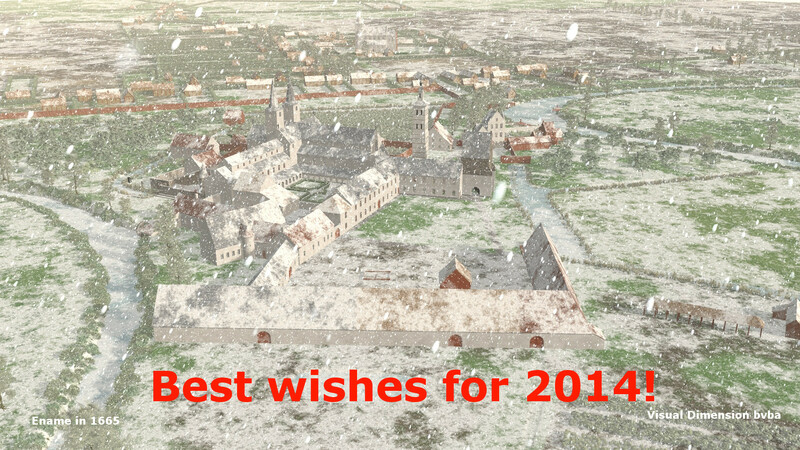 Best wishes for a Splendid 2014 from us all here at Visual Dimension bvba! The image shows Ename in 1665 in the snow. In the top part of the image is the place, where 350 years later our offices are and from where I write this … We haven’t seen snow yet until now, so we bring it to you in digital form! All the best in the coming year! 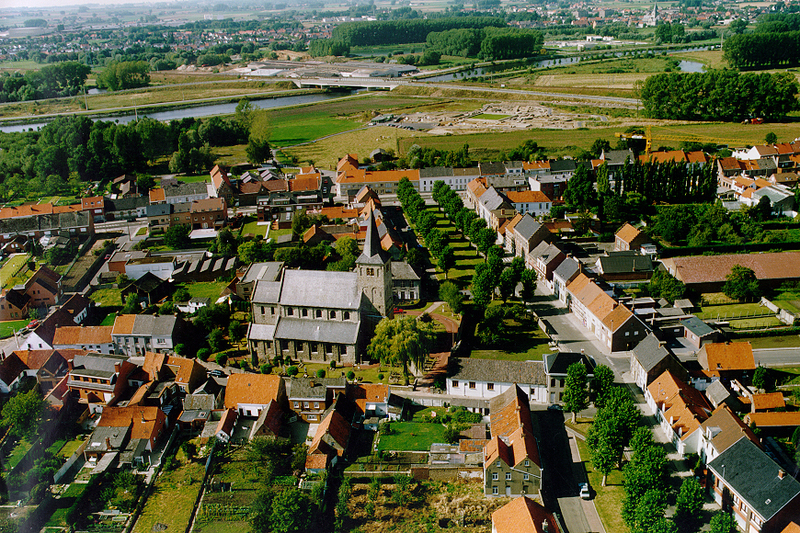 Ename is a pitoresque village in the Flemish Ardennes in Belgium, close to the historical city of Oudenaarde. At first sight, it is a village like so many others. Looking closer however, there is an archaeological park, a church with an intriguing past, a nature reserve, a museum and a heritage centre. Ename has several stories to tell, about its past and about what it is today. One of those stories tells the history of the abbey of Ename, founded in 1063 and dismantled in the last years of the 18th century. 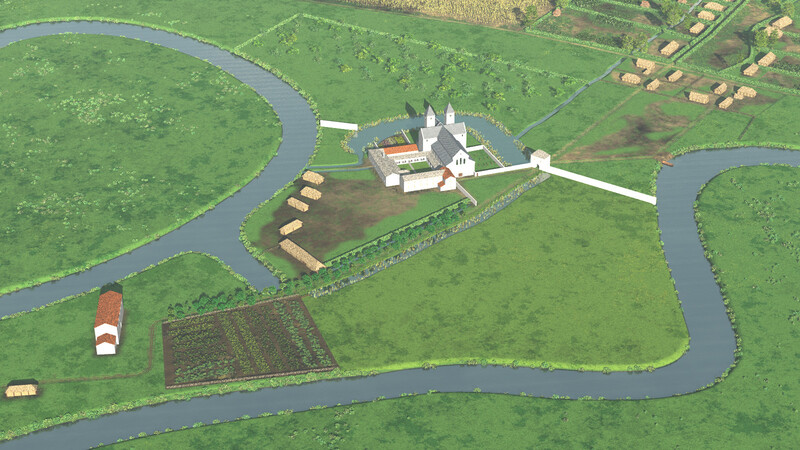 In this blog, we not only tell this story, but we also show how we visualise the rise and fall of this abbey through virtual reconstruction. 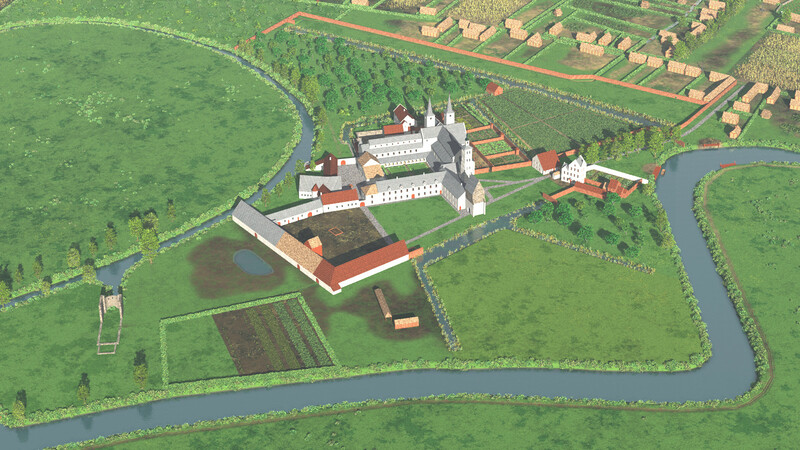 So, we not only try to show you how we turn historical texts and archaeological research into appealing and state-of-the-art 3D visualisations, but we will also turn the virtual reality images and interactive 3D reconstructions into a window on the fascinating life of Benedictine monks in Flanders. And we will experiment with the integration of interactive 3D in blogs! 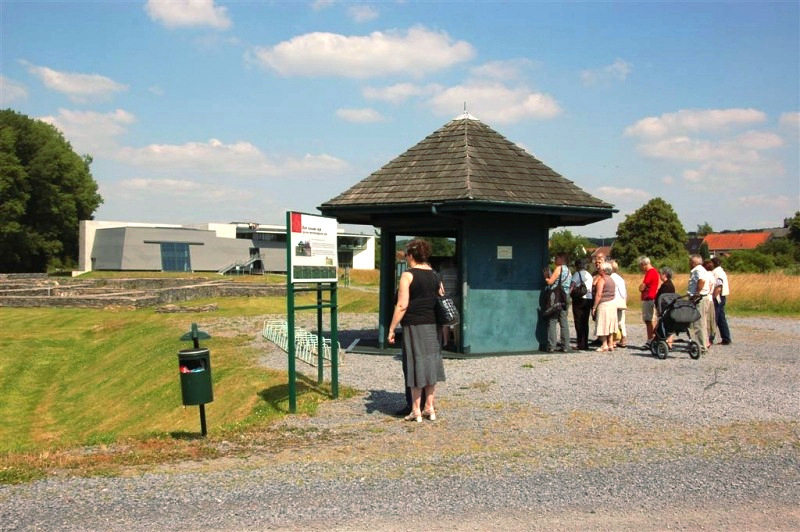 These stories are currently told in the museum, the archaeological park and the heritage centre of Ename. But first of all, let’s have a look at a brief history of the abbey of Ename. Ename did not play any special role until the middle of the 10th century. At that moment, a trade settlement was founded by the Ottonian aristocracy on a large sand-dune next to the river Scheldt. 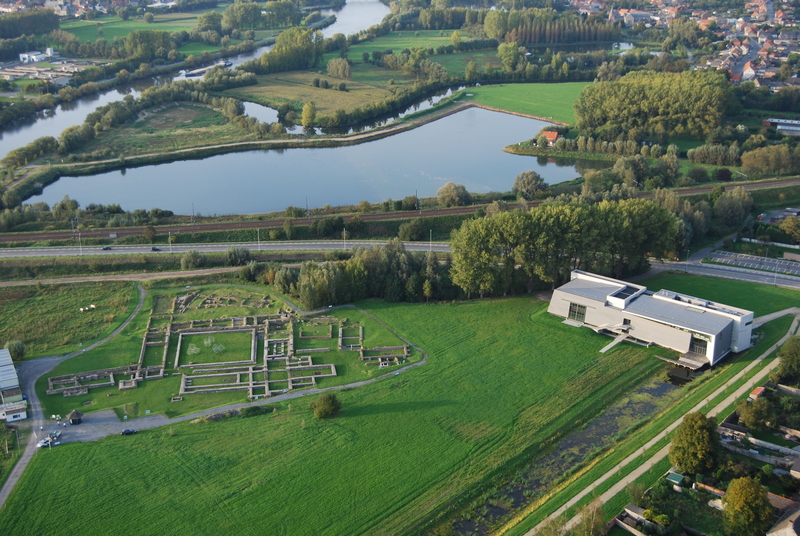 This trade settlement flourished and became around 1000 AD one of the key border settlements of the Ottonian Empire along the Scheldt, together with Antwerp and Valenciennes. It became the capital of the county, taking over this role from Velzeke. The trade settlement evolved into a proto-city with harbour, guarded by a major keep. Its expansion however was aborted by a raid of the count of Flanders in 1033. In 1056, the count of Flanders finally got control over the county, and integrated it into his growing territory. This interesting episode in the history of Ename will be highlighted in an international exhibition in Ename in 2014. 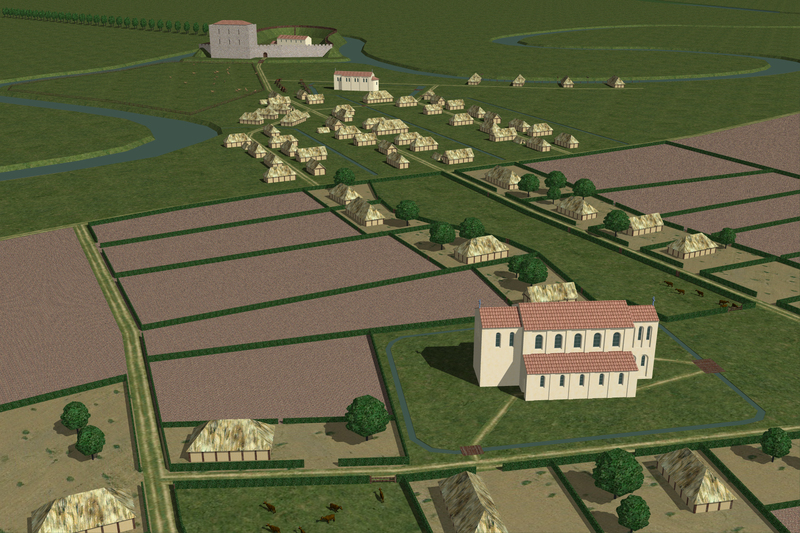 We hope to start another blog in February 2014 about this fascinating period in Flanders. 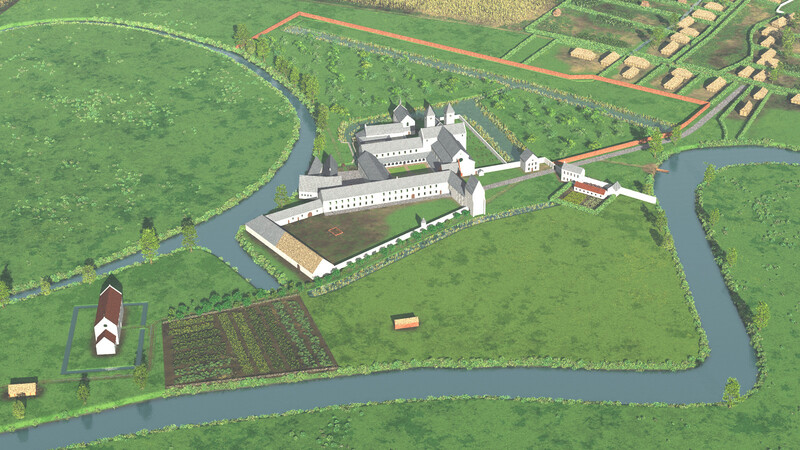 The Ename abbey was founded in 1063, by Adela, the wive of count Baldwin V of Flanders, and daughter of the French king. The abbey was dedicated to Our Lady, used the old palace building of the Ottonian rulers and was started with the help of monks from the Saint Vaast abbey in Arras, France. 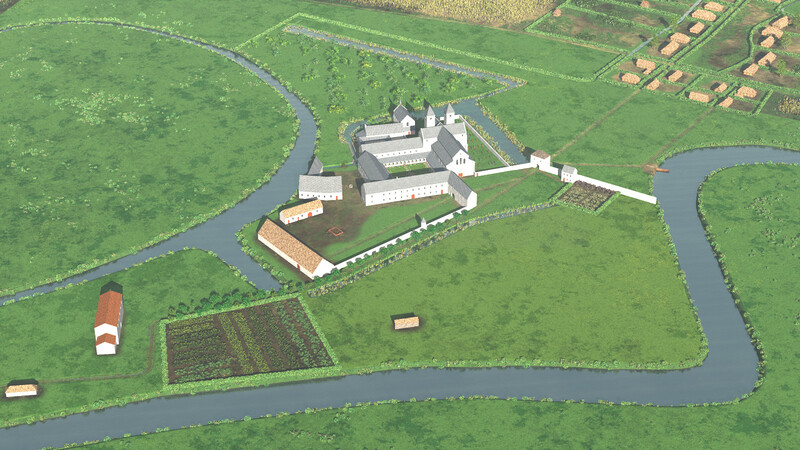 The monks immediately started to build a new abbey, using the Saint Saviour church of the trade settlement and the stones of the Ottonian keep. There were only twelve monks and an abbot. Before 1070, the new Ename abbey was ready, this time dedicated to our Saviour. The palace building was turned into a spacious chapel for Our Lady. Next to this chapel, the monks were running a ferry service over the river Scheldt, as one of the sources of income for the new abbey. In 1139, the monks started a prestigious building program, influenced by their colleagues in Cluny (France) and Hirschau (Germany). The small Saint Saviour church was replaced by a large, splendid Romanesque church. After the building of the church, the whole abbey was enlarged and embellished. 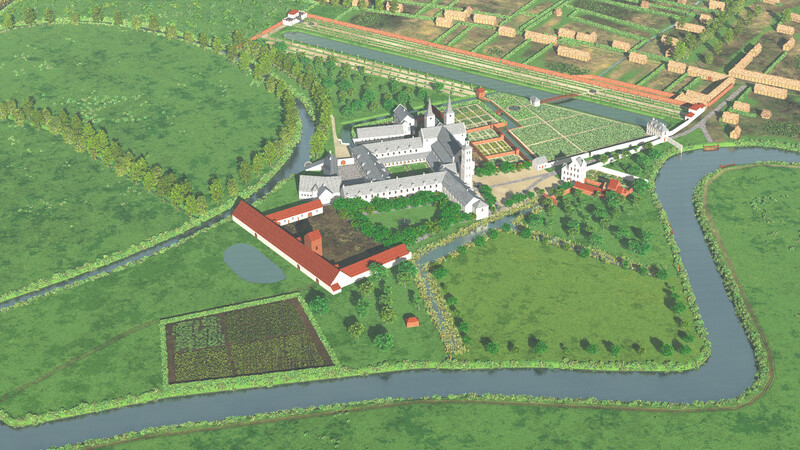 Although small, the abbey was rich and acquired a large number of farms and properties. All the time, the abbey remained very loyal to the count of Flanders. In the first half of the 13th century, the abbey in the new Gothic style was ready. It had everything: a farm, a brewery, a hospital and a large guest quarter with its own kitchen. Already in the 12th century, the monks also had started a scriptorium. It also had its own fish pond as the water of the river Scheldt started to be too polluted. But war and economical crisis raged in the 14th century. During the revolt of Ghent (1379-1385), a real battle was fought on the abbey terrain in 1381 and more than 1000 people were killed. The start of the 16th century was prosperous, the village had expanded to about 70 farms. But the second half of the 16th century on the other hand saw a roaring inflation and turmoil. Protestantism, iconoclasm, high taxes, inquisition and public executions made up an explosive cocktail that resulted in the Eighty Years’ war. 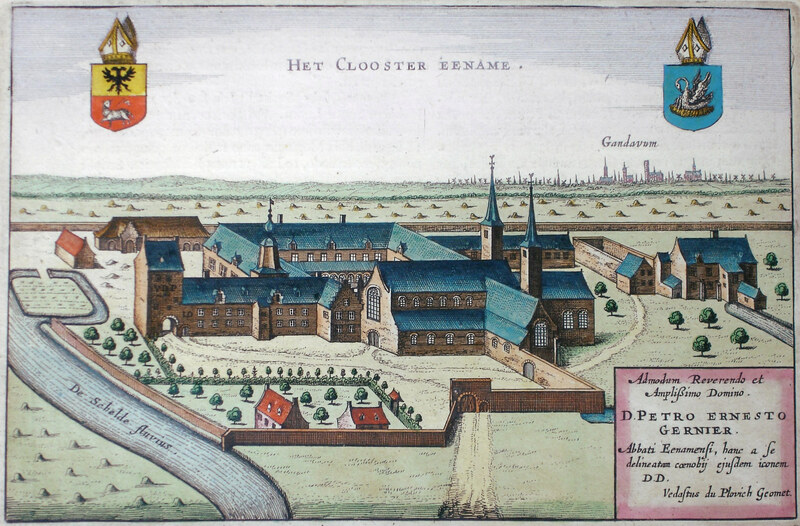 In 1578, the abbey was plundered by the protestants from Ghent. 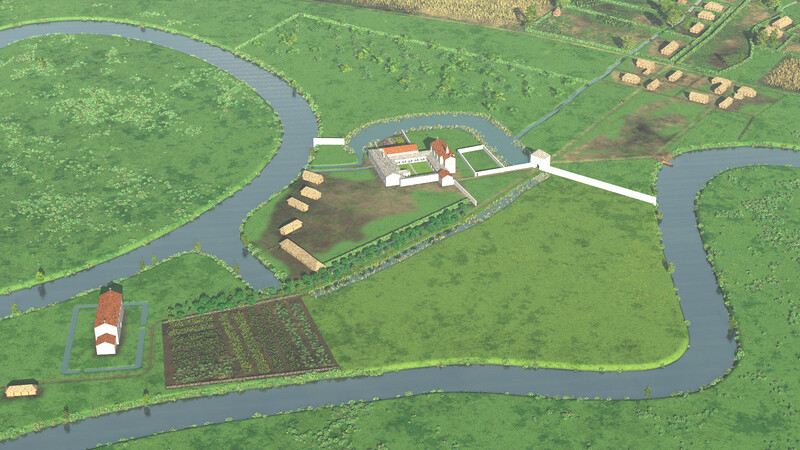 Many of its buildings were taken down to build the new fortifications of Oudenaarde. Most villages in the area became protestant, the Saint Laurentius church of Ename was deserted during 15 years. Although the area was reconquered by the Spanish army in 1582, it took the monks until 1593 to start rebuilding the abbey and the village. It took about 100 years to rebuild the abbey. The abbey had detailed maps made when regaining control over its properties. 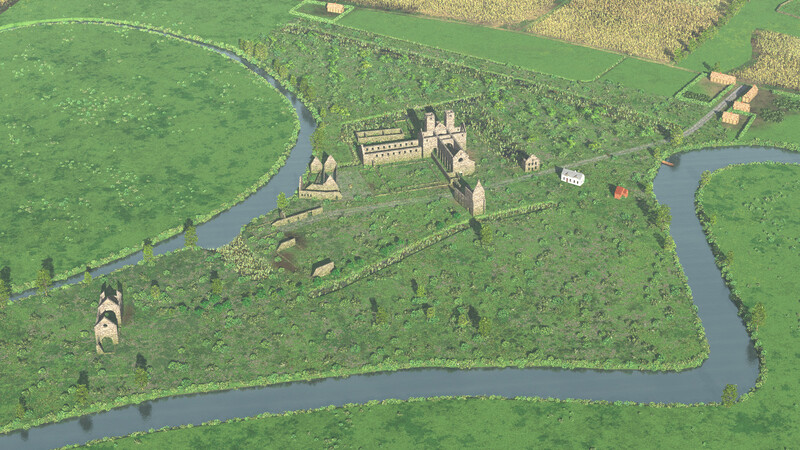 A lot of our virtual reconstruction work is based upon these high quality maps and the detailed descriptions of the abbey by abbot De Loose. In 1730, the abbey got a formal French garden with several pavilions. As all abbots of the Ename abbey were active in national politics, they used these pavilions to meet with their political friends, as they were not allowed to do so within the walls of the abbey. In 1795, the new French Republic confiscated all abbeys. Most of the Ename abbey was dismantled a few years later and sold as building material. Only three abbey buildings remained standing until the beginning of the 20th century. In 1941, the first excavations by Adelbert Vande Walle started. 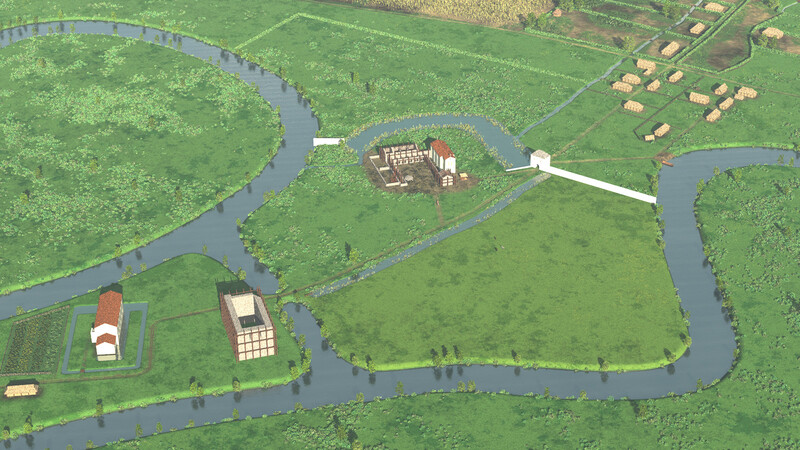 This blog will take you through the process of virtual reconstruction of the Ename abbey through its history from 1063 to 1795. We will show you how we arrive at the reconstructions above, how we document them and share with you our adventure of reconstructing the inside of the abbey on a summer morning in 1288. 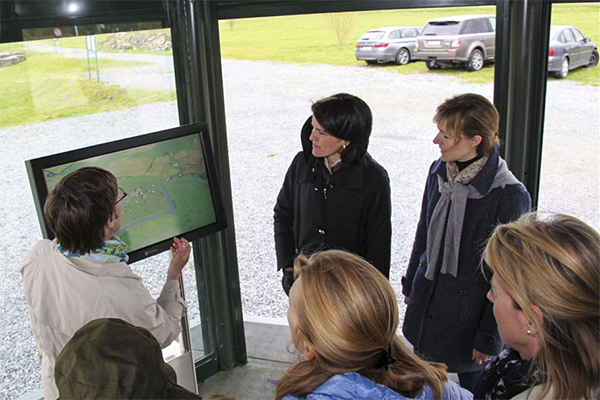 The story of the Ename abbey is also told in detail in an onsite multimedia system called TimeScope and in the Ename museum through an interactive multimedia system called TimeLine. Stay tuned for our journey through time in the abbey of Ename!